A big, burly, capable machine that suffers from one potentially fatal flaw. It is notoriously difficult to use! Recommended for: Diehard coffee purists who want to control every aspect of the drink making process. Large households with multiple coffee drinkers. Busy offices. 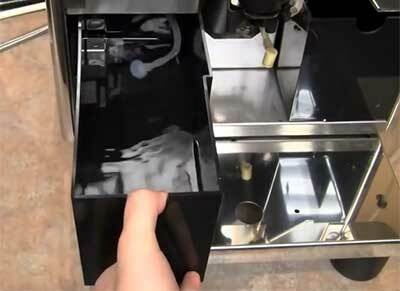 Are you in the market for a top of the line super automatic espresso machine that gives you almost total control over the drink making process? If you’re a coffee purist who craves that kind of control, or if you live in a large household with power coffee drinkers, then you are going to love our in-depth review of the Quick Mill Monza espresso machine. You may have read other Quick Mill Monza Deluxe reviews online, and found them to be a mixed bag, with some categorically singing the praises of this model, while others focused on only the negatives. Admittedly, there is a lot to like about the Monza Deluxe, but it does have one giant, glaring flaw you need to be aware of before pulling the trigger on such a large purchase. In the sections that follow, we’ll go over everything this machine can do (and it can do a lot), as well as highlight its failings, so you’ll have all the information you need to make the best decision for you. The first thing you’ll notice about the Quick Mill Monza Deluxe is its industrial appearance. This isn’t some lightweight appliance; it’s a hulking brute! With dimensions of 17.5” x 14.2” x 18”, it’s probable that it won’t fit under your kitchen cabinets, and if you’re short on counter space, then it may be a real challenge to find a permanent home for this machine. Owing in large part to its stainless-steel construction, the unit weighs a hefty 52 pounds, and it’s possible to run a dedicated water line to it as well, which makes moving it impractical. The potential to use a dedicated water line is significant because there are very few machines designed for mixed home and office use that offer this capability. For us, this is a critically important component of our Quick Mill Monza review, because we’re power coffee drinkers, consuming oceans of coffee every single day. A generously-sized reservoir is essential; the bigger, the better! In this regard, the Monza Deluxe delivers in style, offering up a mind-boggling 3-liter (101.4 ounces) capacity. Even if you opt not to run a dedicated water line, with a capacity like that, it can keep pace with even the most rabid coffee drinkers out there. This feature alone makes it ideally suited for large households or busy offices. Note that the reservoir does not use a water filter, so you’ll have to either accept that you’ll need to descale the unit on a regular basis or use distilled water, or water filtered at some other point. Most other super automatic espresso machines offer some predefined number of grind settings. That’s not at all how the Quickmill Monza works. It utilizes what’s known as a “stepless grinder,” which means when you turn the dial, it will grind either more coarsely or more finely, depending on the direction of the turn, but there are no pre-defined settings. This is both a blessing and a curse. On the one hand, it allows you unlimited freedom to dial in your preferred flavor setting, without having to deal with arbitrary constraints imposed on you by the company. On the other hand, though, it means that you’ll have to spend some time experimenting to get the flavor just the way you want it. Note that if you set the grind too fine, and the dosing strength too high, you’ll wind up with grounds in your cup. Some people don’t mind this. A few genuinely like it, claiming that it enhances the flavor of whatever drink you’re making. Most people, however, especially in the American market, aren’t too fond of it. The grinder is also quite loud. This is likely not a deal breaker for most people, but it bears mentioning because it might influence where you decide to place the machine. 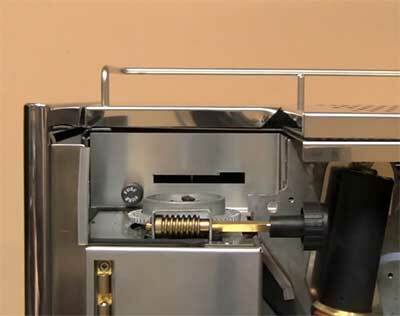 The Monza Deluxe also offers a two-scoop bypass doser for those times when you don’t want the “bean to brew” experience, but here we begin to see the difficulties in operating the machine. To access the bypass doser, you’ve got to open the front panel of the unit. It’s a small thing, but highly inconvenient. Our one complaint on this front is that the top loading bean hopper only has a capacity of 12 ounces, which isn’t well-paired with the massive size of the water tank. That means that if you have it set up in a busy office, or in a household where there are lots of coffee drinkers, you’re probably going to have to refill the hopper more often than you’d like. It’s a small thing, but worth drawing your attention to. Here, we have to say we were genuinely disappointed. Given the price of this machine, we were expecting it to have two boilers, which would allow you to simultaneously steam milk and pull shots. Sadly, this is not the case, although it should be noted that the Quick Mill Monza’s single boiler heats quickly and can rapidly shift from one task to the other. That’s an undeniably good thing, but again – for the price, we were expecting more. The coffee spouts of the Monza Quick Mill don’t move up or down, but the company does provide a stainless-steel tray you can set smaller cups on to put the rim of the cup closer to those spouts. If you’re using a larger cup (the machine will support cups up to 6” in height), it’s a simple matter of removing this tray. Even password protect your machine to keep someone from accidentally changing your preferred settings! You can control just about every aspect of your drink’s creation, but there’s a catch. The menu system is difficult to navigate, primarily because of the primitive LED the model makes use of. It just makes navigation a chore and increases the machine’s learning curve. Once you master it, you can make serious coffee magic happen, but until then, you’re often going to feel as though the unit is actively fighting against you. There’s not much to say about the brew unit, except that it’s fixed position and cannot be removed, and is made of metal. That’s significant because literally, every other machine we’ve reviewed to this point has a brewing unit encased in ABS plastic, whether removable or not. The chief advantage here is that it provides better and more even heating for the drinks you create. We’re not 100% sold on the idea that it’s worth the added cost, but it’s an interesting addition and certainly worth mentioning! Before we talk about the Monza’s pump, it’s important that we say a few words about the key difference between drip-brew coffee and espresso. 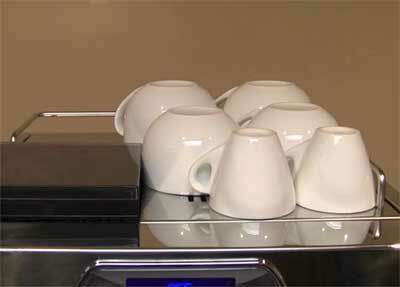 Drip-brew machines rely on gravity to get your copy from the brewing chamber and into your waiting pot or cup. Espresso machines use pressure, and pressure is measured in bars, where one bar is equal to atmospheric pressure at sea level. To make a great espresso, you need at least nine bars of pressure, and the Monza’s pump is rated at a hefty fifteen bars – more than enough to create world-class espresso, every time you use your machine. We should also point out that the pump has a regulator on it so that when you’re using it to create milk froth, the pressure output changes to around 2 bars. Curiously, the machine does this automatically, and this is one of the few features you can’t manually adjust from the control panel of the device. The Monza Espresso Machine offers a masterful implementation of this feature, giving its users access to both an auto-frother and a steam wand. This is the best of both worlds. If you don’t want to bother with fine-grained froth control, the auto-frother is ready. If you want to show off your mad Barista skills, you can do that too! 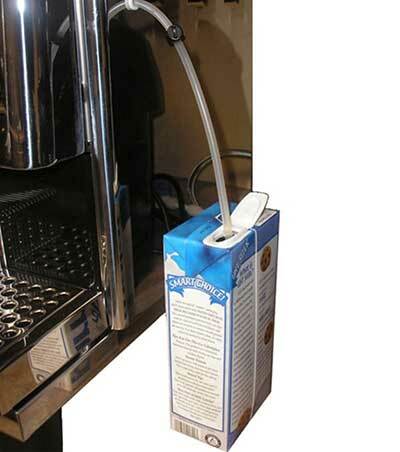 Whichever option you choose to use, you’ll need to run plastic tubing from the machine into whatever container your milk is in. It’s a small point, but we really don’t like systems like this because it makes your very expensive coffee machine look like a high school kid’s science project. Having said that, a great many machines being sold today use the same basic implementation, so we’re probably a distinct minority in being bothered by it. Note that this machine can be a One Touch if you use the auto frother. Obviously, if you’re using the steam wand, then you’ll have to prep your milk separately. Also note that the auto-frother and steam wand operate on a timer, so don’t be surprised or alarmed if they simply stop before you get your desired amount of milk froth. To get more, it’s as simple as pushing the button again to activate that feature. You can also stop the function at any time by pressing the same button, and of course, you can set the time both of these run by adjusting the settings in the menu of the control system. 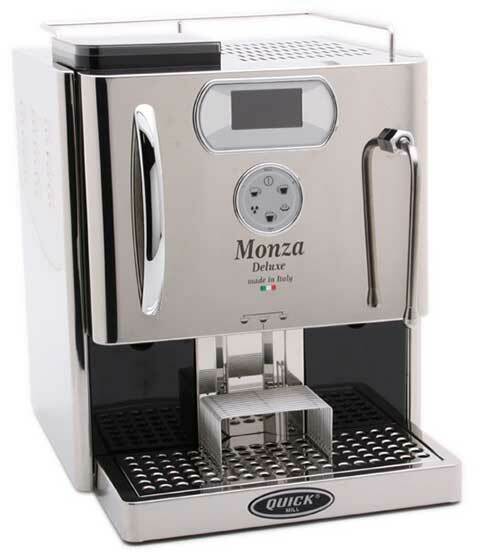 The Quick Mill Monza Deluxe super automatic espresso machine has a generously sized, passively heated cup warming tray, but you may not need it, thanks to the heat the boiler is capable of producing. A lot of people overlook the value of the humble cup warming tray though, and in many ways, it’s the unsung hero of the specialty coffee world. The problem you often encounter is that, especially when you’re crafting a milk-based drink, the final temperature of your concoction is somewhat lower than some people prefer. That problem gets worse when you dispense your drink into a cold cup, which maximizes heat loss. The cup warming tray does a lot to mitigate that problem. Our suggestion is that you try making your drink without using it, and if the temperature isn’t quite to your liking, make another, this time, using the warming tray. You’ll be pleasantly surprised at the difference it makes! This is the one glaring weakness of the Monza coffee machine. It’s almost ridiculously difficult to use and clean. Oh, you can pull a simple shot easily enough, but if you want to refill the water tank and don’t have a dedicated line, you have to open the front panel, which shuts it down completely. It’s the same story if you want to use the bypass doser, as we’ve mentioned previously. 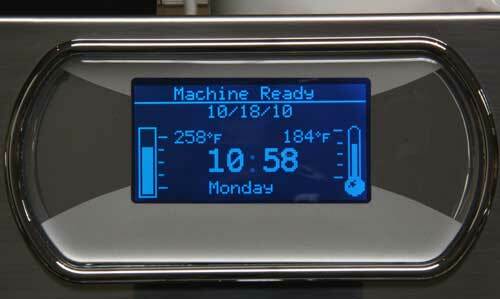 Once you get used to the cumbersome interface, navigating the menus gets a bit easier, but the Monza would be well served by the addition of a TFT (Thin Film Transistor) display, which would radically simplify menu navigation. While it’s true that you can program and highly automate most of the cleaning functions, doing that is a chore, again, due almost entirely to the interface (although once you’ve programmed it, maintenance becomes a snap). The sheer number of settings you have control over is magnificent, it’s getting to them that’s problematic. The Monza Quick Mill clearly has a lot going for it. It can do just about everything, and it gives you the option to direct-connect a dedicated water line to it so you never have to worry about filling the expansive water reservoir. That said, there are two compelling drawbacks to this machine. First is its price. It’s simply going to be beyond the reach of the bulk of the market. Second, it’s insanely hard/cumbersome machine to use. Almost everything you want to do, including something as simple as make use of the bypass doser, requires that you open the front panel, and when you do, it powers off the machine. If you’re not fast enough using the bypass doser, it’ll reset entirely and kick the grounds you put into the bypass chamber into the dregs box. A machine designed for the mass market simply shouldn’t do things like that, and those are tough points to get around. A potential third drawback is that the machine only comes with a 1-year warranty. Many of the top manufacturers offer 2 year warranties, with some even offering 3 or 5 years. That’s telling, and something to bear in mind. 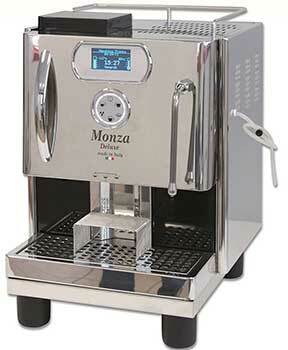 Other Quick Mill Monza Deluxe Reviews you’ll read online are more forgiving of the model when it comes to ease of use. We respectfully disagree, and our final score of the unit is reflective of that. While it’s true that this machine has a lot to offer the right user, we feel that it’s needlessly cumbersome and complex to operate. As such, we only recommend this machine to diehard coffee purists who want maximum control over their drinks, and who are willing to do the work required to get it, and to people who need a high-volume espresso machine. For everyone else, there’s a better, or at the very least easier to use machine out there. Quick Mill Monza Deluxe User Manual. Quick Mill. Official Brand Website. Double Boiler Versus Heat Exchanger. Fine Coffee Company.